Use of a sling for 3 weeks post-op unless otherwise indicated. No pulley in the first 6 weeks. No resistance until 4 ½ months, periscapular strengthening ok. Minimize heavy, excessive cyclic loads for the first 6 months. Maintenance of good postural positioning when performing all exercises. Maintain surgical motion early, but protect subscapularis repair by avoiding internal rotation strengthening for the first 4 months. Aerobic conditioning throughout the rehabilitation process with pool and land therapy. All active exercises should be carefully monitored to minimize substitution or compensation. M.D. follow-ups Day 1, 4 weeks, 3 months, 6 months and 1 year. Nurse visit day 2 to change dressings and review home exercise program with PT. Soft tissue mobilization to surrounding tissues, effleurage for edema. Passive range of motion into flexion and external rotation as tolerated to neutral ranges. A/PROM for hand and elbow. Cervical stretches, scapular squeezes, lower trap squeezes. Well-body cardiovascular exercise (stationary bike, elliptical without arms, stairmaster). Decrease pain and edema. Continue sling use. Passive range of motion flexion to 90 degrees, external rotation to neutral. Nurse visit for stitch removal at Day 14. Continue soft tissue treatments, passive range of motion, scapula glides, light joint mobilizations as tolerated, nerve glides as needed -Pain control (i.e. cryotherapy, massage, electric stimulation). Begin pool exercises for water assisted exercises as tolerated. Scapular strength training exercises with theraband. General conditioning as tolerated (include trunk flexion & extension exercises). Decrease pain and edema. Continue sling use, but begin weaning from sling to night and out of house as needed at 3 weeks. Passive range of motion flexion, abduction, internal rotation to 90 degrees. Active assisted range of motion flexion, abduction to 90 degrees with good mechanics. MD visit for one month post surgery. Continue as needed for soft tissue, fascial, and joint mobility, nerve glides as necessary. Progress scapular strengthening into further protraction-retraction. Continue weaning from sling with slow progression toward normal ADLs. Full passive range of motion. MD visit for 3 month post surgery. Continue as needed for soft tissue, fascial, and joint mobility. Begin strengthening against gravity in straight planes with AAROM and AROM from supine, seated to standing. No combined motions. Pulley ok. Start external rotation exercises (minimize reps 5-10). 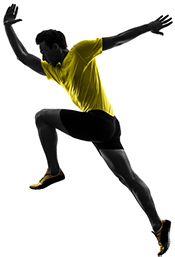 Initiate sport specific training as tolerated with no pain. Continue strengthening, endurance training, and overall fitness.